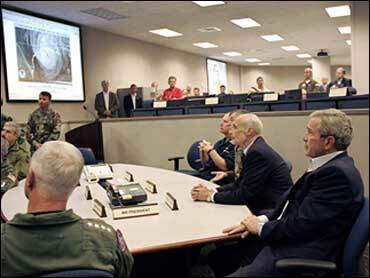 President Bush tracked Hurricane Rita on Saturday from an Air Force base in the Rocky Mountain foothills, getting reports on flooding, search and rescue efforts and damage caused by the storm more than 1,000 miles away. "Our federal government is well organized and well prepared to deal with Rita," Bush said. "The first order of business now is search and rescue teams, to pull people out of harm's way," he said. Bush warned people evacuated from coastal area to be careful about returning home. "The situation is still dangerous because of flooding," Bush said. "It's important for them to listen to the local authorities about whether or not it is safe for them to return to their homes." In a room with eight televisions, video screens and computers, Bush got a one-hour briefing from federal officials about the military response to a storm that they said hit the Texas-Louisiana border with 91 miles per hour winds. Bush went to the U.S. Northern Command to see firsthand how the military was working with state and local officials in responding to the hurricane, which was expected to dump nearly 25 inches of rain in eastern Texas and western Louisiana. CBS News correspondent Mark Knoller reports that the president is making an effort not to repeat the missteps of the day Hurricane Katrina struck when he went ahead with Medicare events in Arizona and California. The trip comes as polls find Bush's job-approval ratings at the lowest levels of his presidency, following a widely held perception that he and federal agencies had responded sluggishly to killer Hurricane Katrina. From Colorado, Bush planned to stop to Austin, Texas, the home of the state's emergency operations center, and then to San Antonio, where he was to spend the night. He was expected to make additional hurricane-related visits throughout the weekend, but the White House did not say where he would go or when he planned to return to Washington. The trip to Peterson Air Force Base, home to the Northern Command, came as polls find Bush's job approval ratings at the lowest of his presidency. The administration was criticized heavily for what was perceived to be a sluggish response to Hurricane Katrina. Bush flew over the Gulf Coast two days after Katrina hit on Aug. 29 and visited the area two days later. The White House said Bush stayed away so he and federal officials would not get in the way of recovery efforts. This time, Bush arrived at the Northern Command a day before Rita hit the shore. Hurricane response from the military is organized through the Northern Command. It was set up in 2002 as part of the government's moves after the attacks of Sept. 11, 2001. In preparation for Rita, the Northern Command sent satellite phones and long-range radios to avoid post-hurricane communication breakdowns. The Northern Command also made plans to survey damage and recovery needs faster than it did during Katrina. During Katrina, the Pentagon did not name a military joint task force headed by Lt. Gen. Russel Honore until a couple of days after the hurricane hit. This time, Lt. Gen. Robert Clark was named the task force commander before Rita came ashore.